We’re hanging on tight to every minute we have with the little hummers. We’ve probably gotten up to 35-40 now and they really come out to play toward dusk. 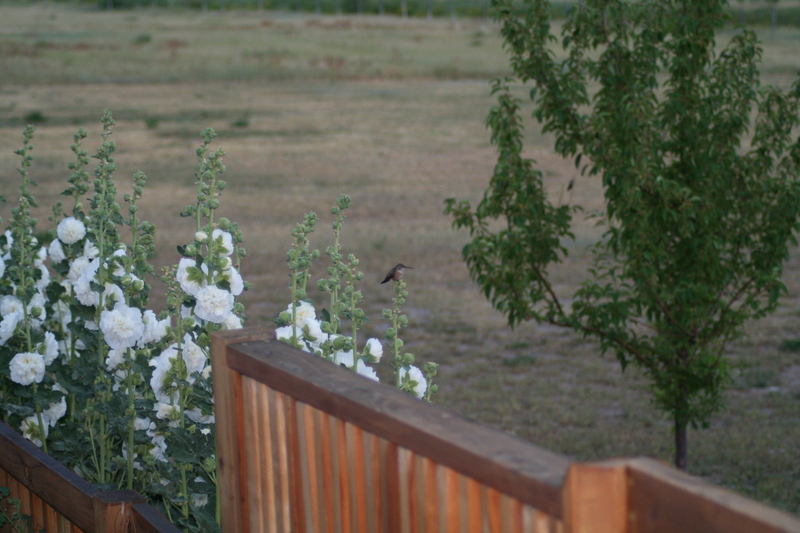 They like to perch on the hollyhocks or a thorny little tree in the back yard. I don’t know what they like that mean one, but they do. They’ll probably be leaving before long and we’ll miss them. Isn’t that sweet. I bet yours are eating you out of house and home like our are! I wouldn’t change a thing though. i love our hummers, too! They’re such fun to watch. Mischievous at times. The back deck “hums’ with their activity.